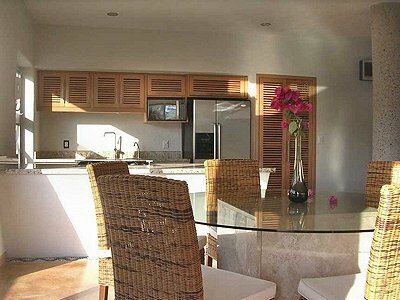 Panoramic mountain view, 2 bedroom 2 bath condos, with pool. 5 minute walk to beach, restaurants, shopping and town square (C-13 on the map). Construction completed in 2009. Contemporary Mexican architecture with seamless indoor outdoor living spaces. 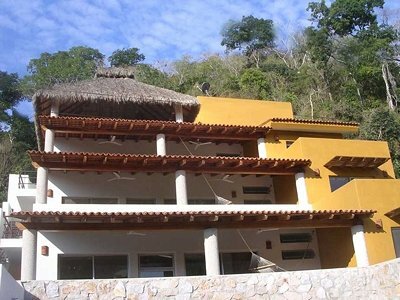 Breathtaking mountain and jungle views, in a secluded quiet neighborhood with a 5 minute walk to the beach, restaurants, shopping and town square. Spacious luxurious 2 bedroom 2 bathroom condominiums, including I king bedroom with ensuite bathroom, and I queen bedroom and bathroom. Each bedroom has it’s own private balcony. Large open concept living room, dining room, and kitchen surrounded by glass sliding doors and windows providing lots of natural light. Each unit has private terrace with comfortable seating and dining area. A fully equipped kitchen complete with icemaking fridge and water dispensing system. 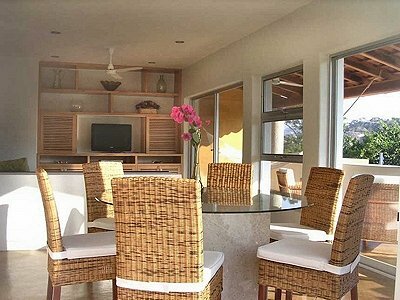 A separate palapa level with panoramic view of the mountains, comfortable seating area including kitchenette and 1/2 bathroom. Palapa connects to a relaxing great escape of private pool and sundeck, with gas BBQ, chaise lounges, and poolside seating. Features include: Satellite T.V., Wireless internet, Automated electric doors with interphone. 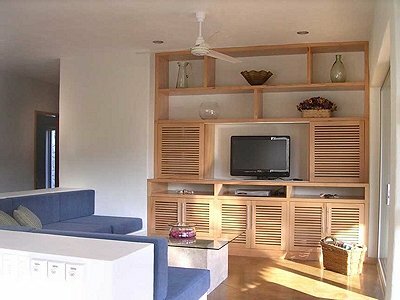 Air conditioning and ceiling fans in all rooms. Blackout window coverings in bedrooms. Each unit with own pressurized water system. Off street parking. Washer, dryer, available. Housekeeping services once per week.